Being a plus size most of my life, means that most of the sewing I do involves scaling up patterns. Today as we are in Makers Month mode I thought I would share how I do that with one of the patterns I have done this with recently, The Bettine dress from Tilly and the Buttons. This is a great pattern to practice sizing-up on as it is reasonably straight forward to sew and the pattern pieces are simple. I use a sewing curve, also called a French curve or a pattern master depending on who you talk to about it. It has two straight sides at a right angle and a steep then sloping curve along the other. Mine has lots of helpful measurements and guidelines on it which help with measuring and creating your own curves for pattern making from scratch. I am lazy and generally prefer to alter an existing pattern to making my own from scratch. 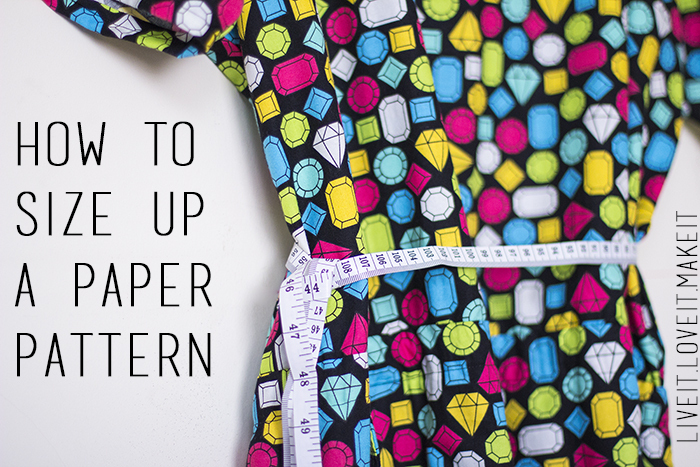 Most paper patterns have multi size options printed on the pattern sheets. 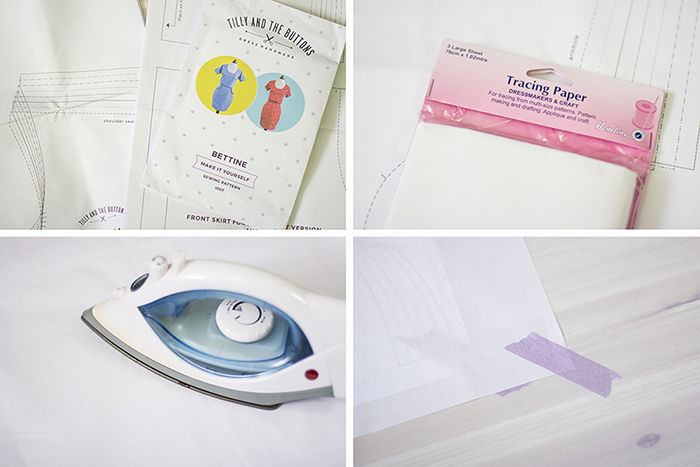 you can use these to scale the measurements that you will need to use to size up, you will also need dressmakers tracing paper or you can use greaseproof baking paper. I always iron out the original pattern paper and my tracing paper before I start as both have usually been folded in a packet for some time. Take care not to scorch the paper, I usually set it on a wool setting/ two dots. My last tip before we start is to tape down your pattern and tracing paper with masking or washi tape so the layers don't move about until you move them. Start by taking a look a your pattern pieces, some lines won't move but will need extending, some will need moving and curves will need shifting. Curves (in general) should not need to be altered, you can see that the curves don't change shape they just move, it will be the lines they are connected to that will be moving therefore the curves can just be traced into their new position. Your pattern should be taped to your table and the tracing paper placed over the top. Photo 1. Trace all the lines that are not moving, in the case of the Bettine it is the centre fold and the waist, but extend the lines past the edges. Photo 2. Mark the end of the lines that need moving, for instance the armpit line where the curve starts. Photo 3. 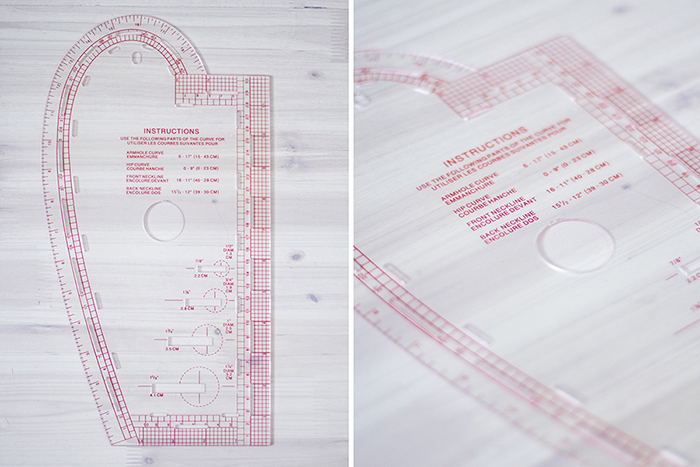 Peel back the tracing paper and measure the difference between the biggest and the next size down. This gives you the measurement for where the next size up line should be. Photo 4. 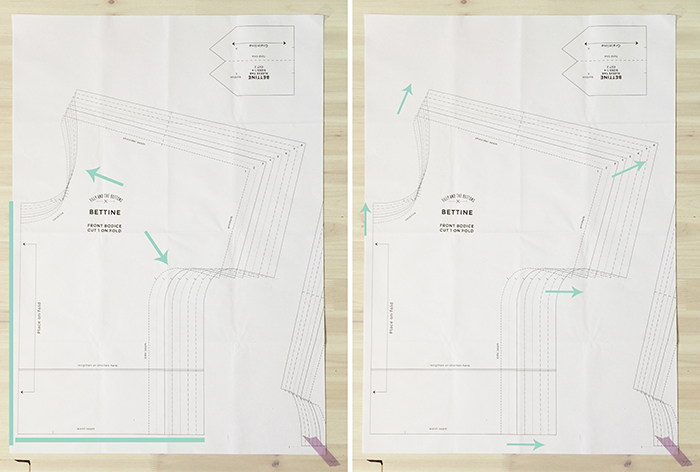 Pop the tracing layer back in place and use the measurement to add as many sizes as need be to your pattern. I have added 3 sizes to mine by moving the line over three times the measurement that I took. Photo 5. Draw your new line up to meet the marking you made for the end of the line, where you new curve will start. Photo 6. Next is the line on the other side of that curve, the bottom of the sleeve. The position of this is affected in two directions, the line moves up and across. Photo 7. You can see here I have added the measurement for one size at a time until reached the size I wanted, I find it easier with those fiddly bits to mark every size increment. Photo 8. Again, you want to measure the length of the straight line to where the curve starts. Photo 9. Mark clearly where the curve begins. You then want to un-stick your top sheet and slide it over until the curve on the pattern underneath is in line with the markings you have made. Photo 10. Then you can trace the curve exactly in place. Photo 11. Some lines will be easier to scale, the top edge of the sleeve for instance can be sized up following the diagonal line created by the sizes below. Photo 12. Again using the measurements from the sizes below you can add as many sizes as you might need to make your pattern fit your needs. If you are also looking to lengthen or shorten your paper pattern, the pattern itself may have markings on it where you can do so. 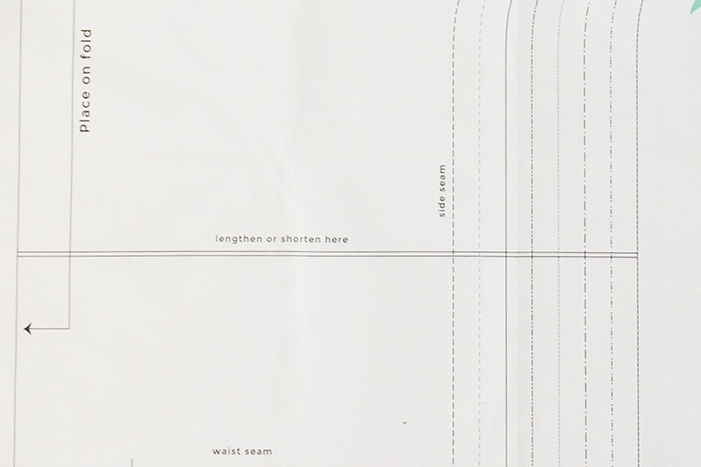 Tilly's helpfully do, so all you would have to do here is measure how much longer you want your finished garment to be and add in a section by allowing for that in your traced pieces. If you forget to add it whilst you are tracing, you can always go in and add in a section by cutting and taping an extra piece in place of by folding the pattern at that point. This process is the easiest, most accurate way to size up or down that I have found but it is lengthy to explain. I do hope that my explanation is clear enough to follow and use for your own pattern sizing experiments. If you are unsure check out this article from Craftsy.com for another style of up-sizing. If you have any questions, feel free to ask in the comments and I will do my best to answer them. If you are interested in Tilly's patterns we now stock the full range of printed patterns at Sew Crafty Online. Tilly has a great post on her blog about adding a seam allowance if the pattern you are using doesn't have one (all Tilly patterns have the allowance included) if that is something you are interested in. I hope that might help any of you that are above or below standard pattern sizing but desire a handmade wardrobe.